Dinner with Friends is presently playing at Everyman Theatre until April 7, 2019. Everyman is located at 315 West Fayette Street, Baltimore, MD and is easily accessible by car or public transportation. Dinner with Friends is a Pulitzer Prize winning drama that deal with the issues of marriage, divorce and friendship that is unpredictable and witty. I had the chance to interview one of the actors from this production, Beth Hylton, who plays Karen. Beth Hylton is a DC-based actress and a member of the resident company of Baltimore’s Everyman Theatre. She is represented by Renee Glicker of About Artists Agency in NYC and earned her MFA from the Professional Actor Training Program at UNC-Chapel Hill/PlayMakers Rep. Some of Beth’s very favorite roles include Blanche in A Streetcar Named Desire and Sarah in Time Stands Still at Everyman, Amanda in Private Lives at Pittsburgh Irish and Classical Theatre, Bev/Kathy in Clybourne Park at Baltimore Center Stage, and Nora in A Doll’s House at Gulfshore Playhouse. 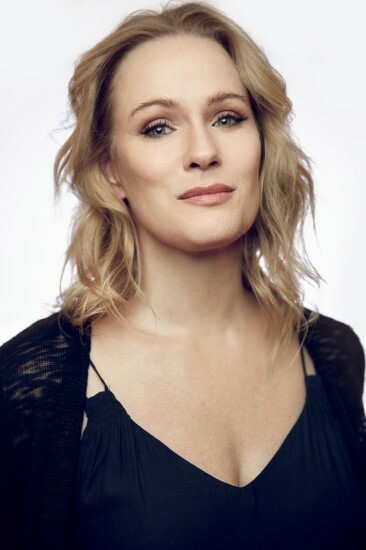 She has also appeared in world premieres and in contemporary and classic plays at theatres including Woolly Mammoth, The Kennedy Center, Ford’s, Round House, Rep Stage and The Olney in DC, and at Weston Playhouse, The Public Theatre of Maine, Hippodrome State Theatre and PlayMakers Rep as well as at other regional theatres. In New York, she was a founding ensemble member of The Ground Floor Theatre Lab and performed off-off-Broadway with Gorilla Rep, Todo Con Nada and in the NYC Fringe. She is a proud member of SAG-AFTRA , and of Actor’s Equity. Did you always want to be an actor if not when did you decide to perform? I really did always want to be an actor. Well, that is not quite true: I wanted to be MAGIC, and if I couldn’t be magic, then I wanted to be an actor. It was clear pretty early on (by 7, at least) that I wouldn’t be able to fly, or make myself invisible, so acting it was! I am from a pretty small town in Southwestern Virginia and didn’t have a whole lot of access to the arts growing up, so my curiosity and interest in–and passion for–theatre as a young person is sometimes, in retrospect, kind of gobsmacking. I feel very lucky that my better angels or some underlining positive force inside me pushed me ceaselessly to HERE. I don’t know what would have become of me otherwise. I genuinely don’t. What are the favorite roles you have played and why? Oh my. Well. I have so many. The characters I love most I mourn when they go because I know I will never see them again. They become so real to me I genuinely feel sure I will miss them like a friend I have long known. And I do! It’s so odd and lovely and bittersweet. Blanche in Streetcar was so special because I got to live inside her crazy broken beautiful heart when I was mourning the death of my mother: her pain and heartbreak and “tumble into the abyss” felt like the only thing keeping me from tumbling into an abyss of my own. Amanda in Private Lives is an all-time favorite, and I was and am super proud of that production: we found the beating heart inside the wounded, glittering, gorgeous people in that beautiful, sparkling play, gorgeous words, gorgeous costumes, and so much love underlining all of it. More recently, last season at Everyman, Marie Antoinette in Revolutionists was a comedy dream come true. I have a keen appreciation for the ridiculous and that role gave me the opportunity to indulge in every farcical fantasy I have ever had. What role do you play in “Dinner with Friends,” and what attracted you to that role? I play Karen. I love her so much! She is so desperately seeking to protect and care for the ones she loves, and she sometimes makes mistakes from her impulsivity and ferocity that have unintended cost in her most cherished relationships. She is so utterly recognizable to me, so human and flawed and real. Vinny curates the season to include roles for the resident actors, and when he offered me this play and role, I was so excited! It’s a play I have long known of course (what actor in a scene study class HASN’T come across this beautiful Pulitzer-Prize-Winning work?) and Karen is, on the page, a little uptight, living inside the bright-line rules she has drawn for herself. It’s not quite something I have played–at least in a while–on an Everyman stage, and it gave me an opportunity to lean into the transformative aspect of the work that being part of the resident company affords. We are so, so lucky at Everyman to have that as a part of our creative language. You are going to be part of Brits on Broadway. Could you tell us a little about it (where, when and exactly what it is and maybe where to get tickets)? I am indeed! Handbagged will be making it’s NYC premiere. Some information is here. And you can go to the 59E59 website also for some information on the festival and schedule. What role(s) will you be playing as part of Brits on Broadway and is this your first time? I will be playing “Liz” the younger of the two versions of Queen Elizabeth II (opposite two versions of Margaret Thatcher). I played the role previously at Round House in its American premiere–it was previously in London at the Tricycle (now the Kiln), later on, the West End, and it did a national (UK) tour. It is such a fun show. I am delighted to get to do the show in NYC. I lived there for almost a decade, and it was where I grew up as an artist–I have always kept a foot in the city and representation there, so I am delighted to get to bring a show I was so proud to do in Washington to New York! So often we do things the other way ’round in the regions that this is pretty cool for a “DC show” to move off-Broadway.